As I finish up my first year as Cornell Hillel Executive Director, I want to thank you all for contributing to the strong, vibrant, and inclusive Jewish community at Cornell. I’m proud of the work we’ve done this past year: because of your efforts, over 1500 students attended one or more programs; we’ve hosted major events like Big Red Bar Mitzvah, Josh Peck’s talk, Lilah Lavan, and Shabbat 613; and over one hundred students will have participated in immersive experiences around the world. You have planned hundreds of programs this past year ranging from Israel advocacy and religious celebrations, to social action interfaith encounters. Our work would not have been possible without all of your investments of time, energy and passion. I’d like to say a special thank you, farewell, and mazal tov to the Class of 2017. I with you much success and joy on the next stage of your journey. You will always have a home here, at Cornell Hillel. And the year is not over yet! If finals are getting you down, please make sure to take part of Hillel’s Treat Yourself week. 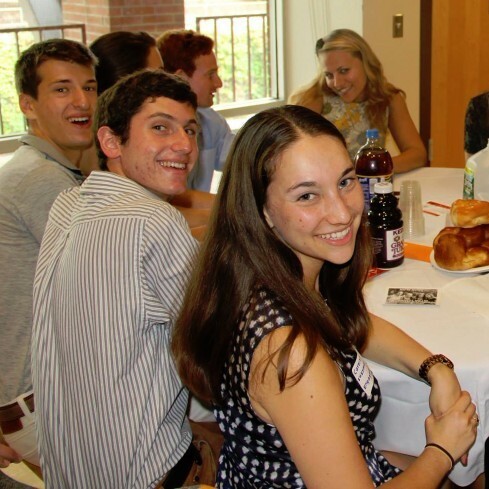 Please come by to Hillel to say goodbye, and if you’re around for the summer, make sure to stop by and say hello. Passionate about Israel? Want to work with our awesome Israel Engagement Team next year? 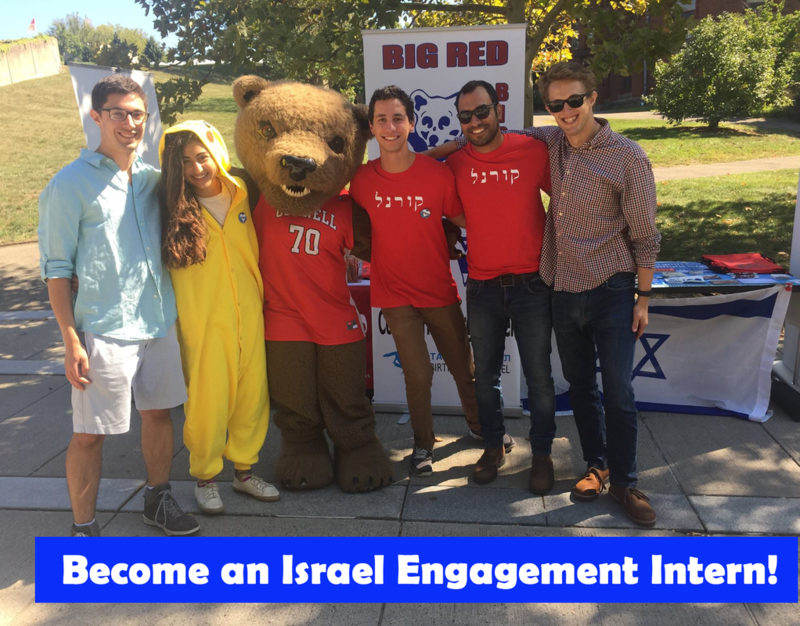 Apply for our Israel Engagement Internship! Applications are due Tuesday, May 30, at 5 PM. Read more about the internship expectations here and apply here. Contact Jacob with any questions. Welcome to Treat Yourself Week, when you focus on de-stressing and having fun! 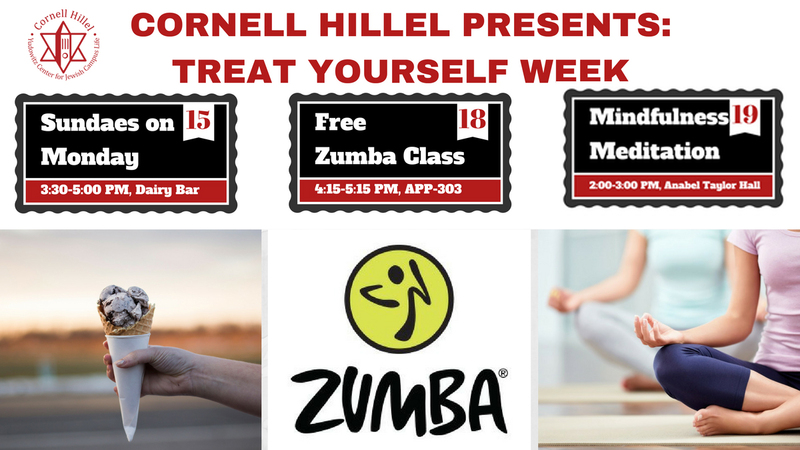 We have tons of free events, including a Dairy Bar Ice Cream break, a Free Zumba Class, and a Mindfulness Meditation with Maddie Feldman! You won't want to miss this! Cornell Hillel is hosting a Food Drive to benefit the Food Bank of the Southern Tier! As you’re packing up for the end of the semester, you’ll probably find extra non-perishable food that you don’t want to bring home. Instead of throwing it out, why not donate it? You can drop off your donations at 104 West and the Hillel office (G-34 Anabel Taylor Hall) between May 10 and 22. Questions? Need someone to pick up your donations? Contact Josh Roth. Pre-register here before noon on Friday for just $10! Walk-ins are also accepted for $2 more. Fill out this form to get started, or contact Alana Gross for more information. The conservative synagogue in Ithaca is looking for an adviser for its youth groups for a year-long commitment. Basic responsibilities include planning, advertising, and running events for the groups. Interested applicants can send a resume and cover letter to Rabbi Suzanne Brody. The Israel Film Center Festival will run in NY and Westchester at the end of May and June 8-13. There are a lot of ways for students who are around for the summer to get involved. There are opportunities for volunteering at the festival and we also offer a student discount for attendees. 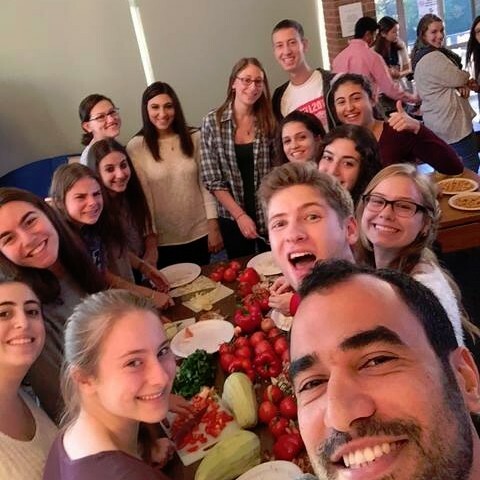 The Fall 2017 Yahel Social Change Program gives young graduates ages 21-27 the opportunity to engage with social change and community work firsthand, by volunteering and interning alongside grassroots activists and educators in Israel's most diverse communities. Using a community-based service learning model, Yahel partners with local organizations and initiatives to ensure that participants contribute in a meaningful way to a variety of valuable programs and organizations. Final deadline to apply is May 26, 2017. Check out our video, brochure or website for further information. Email nina@yahelisrael.com with any questions. The Jews For Animals fellowship trains Jewish students passionate about animal welfare to take action on campus. Fellows will participate in monthly calls with animal advocates from all over the country and lead events on campus to raise awareness of animal welfare issues and learn how they relate to Judaism. The fellowship is a 9-month commitment (September – May). Apply here by June 1st. For more information or questions, contact ilana@shamayimvaretz.org. Join Fashionating Israel for 4 fascinating days of #IsraeliFashion in Tel Aviv, Jerusalem, and the Negev. 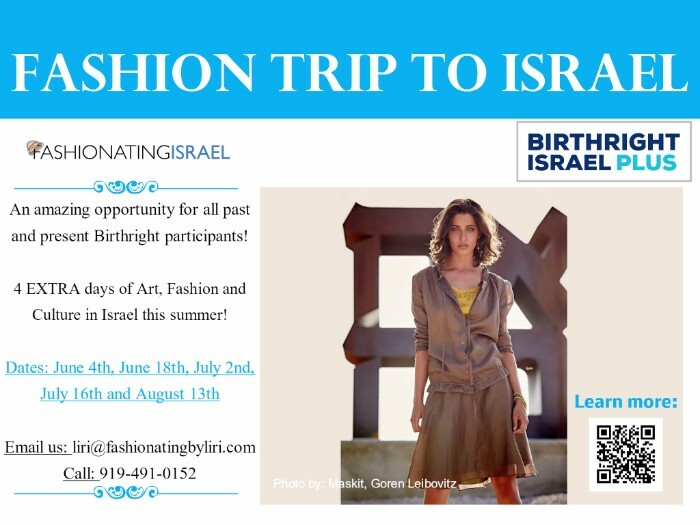 Meet top Israeli fashion designers, explore some of Israel’s best shopping centers, participate in hands-on workshops—from the ancient crafts of weaving and embroidery to Instagram photography, peek into the future of fashion through the most exciting fashion & tech startups, and, finally, work on your very own “Project Runway Israel” with an awesome group of new friends. More information. There is no application deadline, but students are urged to apply as soon as possible. Announcing a new Jewish Studies course for the fall semester: American Jewish Women and the Body of Tradition (JWST 2577). A course on what battles over American Jewish women's bodies can teach us about both Judaism and America. Congregation Tikkun v'Or (Ithaca Reform Temple) is hiring Religious School teachers for the 2017-2018 school year. See our website for more information. 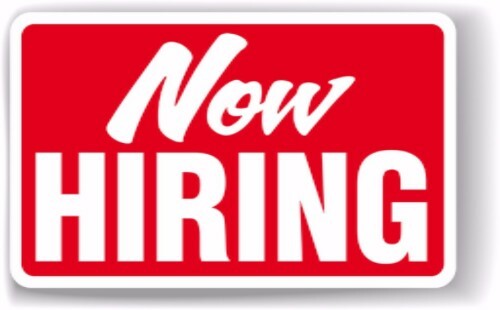 Temple Beth-El is hiring for multiple positions, including Religious School Teacher, Youth Advisor, and Music Teacher. See our website for more information.